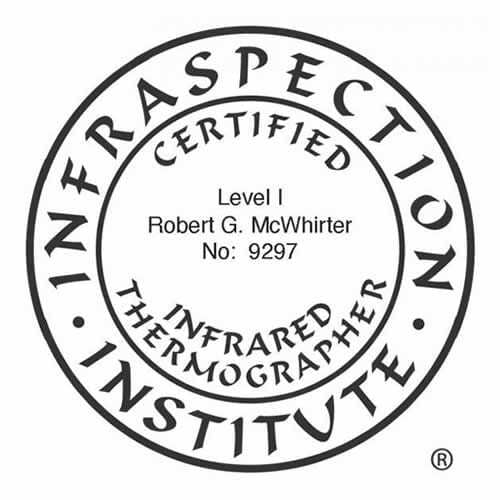 Bob McWhirter is an excellent inspector. He is very knowledgeable, thorough, meticulous and great at explaining things simply in a way you get the message clearly, and listening to our concerns. The thermal heat review is a great added feature for checking heat and insulation. I truly appreciate your work, Bob! The customer service is excellent and the reports with pictures are fabulous! I would definitely recommend Bob and Scenic Home Inspections! Thank you. Bob was amazing! My daughter and I hoped to purchase a cottage and while had seen some issues we knew needed some work, we missed a lot that Bob pointed out. My daughter attended the inspection and Bob made sure to explain everything to her. He was very personable, extremely thorough, professional and knowledgeable- she felt comfortable with him immediately. As we were under a time crunch, Bob worked to the wee hours preparing our report ( I woke at 5 am to see that he sent it at 1:30 am). I couldn’t believe how quickly he had gotten it to us. The report itself was very detailed, easy to understand, and provided pictures and recommendations. I truly cannot say enough. If you need an inspection- look no further! , and done in a professional manor. I was present, and the inspector took the time to not only show me what the problems were, but explained whatever I asked him. I was very satisfied with the complete process and would recommend this company to anyone needing this service. I have to say that we are very pleased with the inspection done on our home. Bob was very knowledgeable and readily available to answer any questions we had. The inspection was very thorough and well presented. He was extremely personable. We felt like we had a friend working with us. This was a comforting because we were out of state buyers. We couldn’t be more pleased. Bob was great. Approachable and friendly, he provided a huge amount of information about the home. He was also very knowledgeable and pointed out a number of things that we would have missed. When a few more concerning issues with the home were found, Bob was very forthright right away. He was cooperative with the sellers agent, and I think was key in us making our point during the repair negotiations with the seller. Bob also offered to come back and inspect any repairs we had decided to make, which was a great bonus. A thorough inspection is an important and expensive part of purchasing a home, and I wouldn’t hesitate to recommend Bob and Scenic Home Inspections. Bob inspected 3 different homes for me before one finally stuck. He has been incredibly helpful to me as a first time home buyer. The first time, he found a major problem within 30 minutes and offered an abbreviated inspection and provided me with a report promptly that gave me enough information to back out of a house. At this inspection, my father, uncle and aunt were present who had various trade experience and they all immediately trusted Bob’s level of expertise and detail. During the second inspection, the other part of the inspection failed and he was more than reasonable with pricing. For our final inspection, Bob continued to go above and beyond to make me feel comfortable with the home inspection process. My entire family and my real estate agent have all been very impressed by his detail, honesty and clear desire to provide the best possible service to his customers. Bob took the time to explain with me in person what each concern meant. His report was done quickly and was user friendly to a lay person. Bob also offered to go back to the home after the details were worked out between both myself and the seller to ensure that the work appeared to be well done. His rates were more than reasonable, and I have already recommended him to those in the area as has my real estate agent. You won’t be disappointed with Bob and Scenic Home Inspections on your team. Thank you! We hired Scenic Home Inspectors for a home in New Durham. We live out of state and were unable to be at the inspection. It had snowed that day, and our realtor said he was on time and did a thorough job. The report was detailed with photos and notes – it was a great tool in making our decision. I would not hesitate to recommend or use this company again. First let me start off by saying Bob is an awesome guy to work with and learn from! He made the whole process and stress of buying a home seem simple! He is the man with the right tools and knowledge to get the job done efficiently, trusting time management and key things to look out for throughout the whole process. Also, Kent septic services did a great job explaining and inspecting as a team with scenic home inspections! Only thing i could of asked for was a video copy of the septic inspections and i wish bob could of offered the chimney inspection as well as tested all appliances that came with the house. (Those things didn’t stop me from using this company and i would use them again if i bought another home) Thank you Scenic Home Inspections! If you are purchasing a home and have little or no “handyman” capabilities Scenic Home Inspection is the company to hire. Every review on this page is correct, Dan truly gives you a top notch inspection geared toward the purchaser. Bob and the rest of the Scenic team were a pleasure to do business with! Bob’s inspection was thorough and he took the time to explain any concerns he had throughout the inspection. The final report included a tremendous amount of detail. Bob also went above and beyond and took the initiative to resolve a septic inspection issue we had encountered. If you are looking for a through, friendly and fair home inspector in NH then Bob at Scenic is the place to go! I would highly recommend Bob and his company. He was extremely thorough and did an excellent job. He was on time , actually early , and was just an amazing guy. You can’t go wrong with Bob. His office is equally as qualified. I called a couple times with questions and they helped me both times. Very professional. Great all around service from start to finish. I called Bob on short notice to inspect a condo in NH. Coming from out of state I wanted to do the inspection on a weekend and Bob graciously accommodated a Sunday morning timeslot. He was thorough and informative throughout and took great care to provide me information as he went along, despite being given a tight timeframe by the seller’s agent. The thermal imaging was very effective at spotting gaps in insulation or defective heat elements. With Bob’s help and detailed report, we can proceed with our purchase with confidence! We recently began the process of buying a lake house and needed a home inspection immediately. Bob responded to my request quickly and was available to perform a complete and thorough inspection when we needed it done. Bob’s report was comprehensive and complete and revealed some concerns for us to pursue. He was also helpful in providing us with the right people to contact to help with the concerns uncovered during the inspection. I would highly recommend Bob to anyone who needs a home inspection! Bob McWhirter literally sets the bar on home inspections! He goes above and beyond what anyone else in this industry does. From the first moment you meet him you understand that he is an honest straight shooter who very clearly has your (the buyer’s) best interest in mind. I have used Bob twice now and will use him for as long as he’s willing to provide his services. My wife and I purchased our first lake home. We wanted to make sure the inspection was done properly and thoroughly so we wouldn’t find any large hidden costs later on. We chose Bob because of his past reviews and couldn’t have been more pleased when Bob completed the inspection. He was thoughtful and informative the entire time on site and it didn’t bother him that I was following him around all the time he was there. We are extremely pleased with Bob’s inspection as it provides us a list of items we can consider during the purchase. Bob Mcwhirter has done a few home inspections for me. He is a total professional, who is thorough in all facets of his job. He is timely and provides in great detail the results of his inspections. I would recommend Bob to anyone wanting a professional , honest home inspection @ competitive pricing. Excellent customer service, inspection completed in a timely manner! Buying a new home is a stress in itself. Having another inspection I was thinking it would be another hurdle and would be a nightmare… but was pleasantly surprised. I can say this was the easiest part of my home purchase! Great communication on process and results! Will be recommending to everyone, Thank you so much for your fast, friendly and knowledgeable service! Bob was very thorough, engaging and detailed in inspecting a condo we’re planning on buying. We had him come during Thanksgiving week and he accommodated our schedule without hesitation. He went above and beyond what we expected in home inspections even for a small place. We also received his report within 12hours that was easy to read and well organized with clear illustrations. We were impressed by the whole process we had with Bob and have already mentioned him to family and friends. The FIRST time we called Scenic Home Inspection I spoke to Bob directly, he was so kid and informative. The house we needed inspected was in Twin Mountain NH (a long drive for Bob) he offered to come up the very next day, but I had to call him later and reschedule. He arrived at the home and conducted his inspection, he was very thorough and helpful, explaining everything the whole time. He didn’t miss a thing. I recieved his offical report the next day with all the information and picture we needed. My 2 year old daughter loved him, which wasnt suprising because he was great with her. Unfortunately we backed out of that house due to a very high radon reading. We continued our house search to find another, because we were so pleased with his work we called him again. He came up to littleton nh and conducted his second inspection for us, again he was FANTASTIC, picking out everything he was concerned about and things that were not up to code. He made our home buying process so much less stressful. He spoke to us like we were valued customers, gave us honest answers because he was always looking out for our best interest and explained everything in a way we could understand. I highly reccomend him to anyone looking to have an extremely thorough home inspection done at affordable rates with a smile. Bob, is now our go to guy for inspections! We’ve recommend him to all our friends and family. Thank you, Bob, for inspecting the home that we are about to purchase. It was a great experience working with you and we appreciate your knowledge, comments, and suggestions! We are secure in purchasing our home and know exactly what to expect based on your findings and report. I highly recommend Bob at Scenic Home Inspections to any home buyer without hesitation! Bob is professional, knowledgeable and communicates quickly and effectively with clients! His costs are much lower but his reports and inspections are MUCH BETTER than others I contacted. I used a previous inspector for another home and Bob’s skills and technology as well as his reports and services were significantly higher quality for a lower price, win-win. I appreciate Bob’s technology used during the inspection as well as for accessing the reports with high quality photos. Bob also emailed and called as follow up to be sure I had all that I needed as I was negotiating with the seller, and he made himself available to go back as needed. Any first-time home buyer will also appreciate Bob’s honesty and thorough report and advise; he works for you, not a real-estate agent looking to sell a house. This work-ethic is hard to come by in this field. Bob and Scenic are above five star quality and service. Bob was recommended to me by my real estate agent and I very grateful he was! It was a pleasure doing business with Bob. I was met with a professional handshake, a warm smile, and eagerness to get doing his job as he was being paid to do. I couldn’t be more pleased with how thorough he was during the inspection. He brought things to my attention, explained what he was seeing and said they would be in his final report. As we went through the home together I had a sincere sense he truly cared about my safety which was priceless to me. True to his word, the final report is extremely well done! Pictures are clear and the description of the pictures were well written with specific details. In addition to Bob’s kind personality, his knowledge of home inspecting is excellent! I would highly recommend him for a home inspection. Bob went above and beyond his job! He engaged our young children, who were with us the entire time. They said, “We love Inspector Bob!” Our young daughter arrived to the new home upset about moving. Bob’s engaging personality turned our shy girl into an eager, smiling assistant home inspector for the day! Bob listened to our concerns, answered our questions, and took the time to methodically inspect every square inch of the house. The report was done promptly, and the information was easy to read and understand. I cannot say enough wonderful things about Bob and Scenic Home Inspection!